Here’s a movie that’s more significant for the repercussions it caused than for its inherent fascinations. 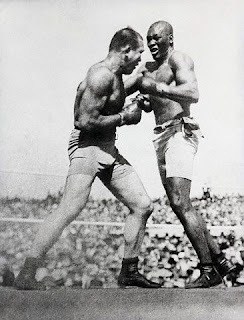 On July 4, 1910, in the middle of downtown Reno, Nevada, two men squared off for the heavyweight boxing championship of the world. One was black, and one was white, and therein lay the problem. On a punishingly hot day (110 degrees), observed by 20,000 spectators, Johnson ground Jeffries down until his side threw in the towel in the 15th round. The fact that a black man had beaten a white man in an athletic competition was intolerable. Race riots broke out that night in more than 25 states and 50 cities. More than 20 were killed and hundreds were injured. Meanwhile, the complete film record of the bout (nine cameramen were on the job that day) was being rapidly copied and distributed for exhibition throughout the country, as films of such contests were routinely done at the time (see “TheCorbett-Fitzsimmons Fight” entry here). Three days after the fight, calls to ban the film began. Eventually, in 1912 Congress banned the interstate transportation of fight films; the ban would remain in place until 1940. Jeffries never fought professionally again. Johnson held his title until 1915, and continued to fight until 1938, when he was 60. He continued to suffer persecution, legal and otherwise, for the rest of his life. The film still exists, now primarily as data for boxing scholars and historians to assimilate. It remains a relic of the sad days when the idea of a black person being the equal or better of a white person was enough to cause panic in the streets.